Societies are very welcome at Highcliffe Castle with a wide variety of options available. The packages are available for groups of 8 or more and all represent excellent value. 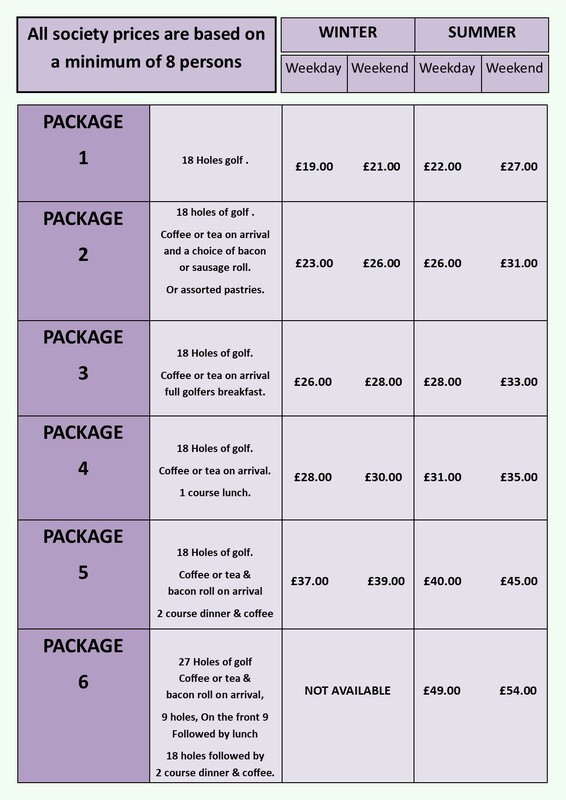 The packages allow for play of 18, 27 or 36 holes and a variety of different menus. If you are looking for a tailored package simply contact the Office. All bookings are subject to a £50 deposit and numbers must be confirmed 48 hours prior to arrival otherwise a full charge will be made. The booking requests can be made by contacting the Office or alternatively by completing the booking form (link below), complete with the deposit. 1. Catering must be included for a society package. 2. Minimum number for a society is 8 persons. 3. Please choose one choice from the menu for the whole party. 4. Meals will be charged for if cancelled without 48 hours notice. 5. Special dietary requirements require 48 hours notice. 6. Societies must play to their allocated times and no exceptions will be made. 7. Choice of courses cannot be confirmed until 7 days prior to playing. 10. Please ensure all in your party comply with the dress regulations. 11. Whilst handicap certificates are not required to be shown before playing, society visitors are expected to be capable players with knowledge of the rules and etiquette of golf. Society visitors are reminded to pick up the pace and be courteous to other players, calling through the group behind if necessary. Highcliffe Castle Golf Club reserves the right to remove any player who does not comply with these requirements. 12. Towels not available - please bring your own.